The "HPC" Power Cylinders are widely used for accurately and positively positioning all types of plant regulators such as Dampers, ID and FD. fans in Boilers, Throttle Valves and Butterfly Valves. 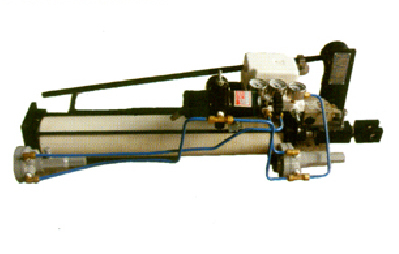 Power Cylinder can be arranged so that increase in control pressure moves the position either outwards or inwards. • Wide range available to meet most requirements. • Control Signal easily achieved on site. • Finish Cylinder barrel and piston rod. • Low friction and long life. • Produced with Quality Systems accredited to ISO 9001 : 2008. By TUV. • Full material certification available for all major component Parts. • Full guarantee on design and Performance. The position-control unit ( D/A VP) incorporated in the power cylinder receives a control signal (0.2 to 1.0 kgf/cm2) from a controller and regulates the high pressure air supply to the cylinder to give a corresponding displacement of the position. The position-control unit operates on the force-balance principle and comprises a diaphragm to receive the control signal, a control spring, one end of which is moved by the piston rod through a cam and bell crank, and a pilot valve to admit and exhaust the high-pressure air supply to the cylinder. When the control signal changes, the diaphragm expands or contracts opening the pilot valve and admitting air to the cylinder to move the piston, any force on the piston less than the designed maximum thrust of the power cylinder will not prevent movement as the pilot valve remains open until the restraining force is overcome and the position requirements are met. The change in the piston's position causes the control-spring force to increase or decrease until a state of equilibrium is reached between the opposing forces of the diaphragm and control spring, the pilot valve is then closed and the piston comes to rest in its new position . CYLINDER BORE 2" to 14"
OPTIONAL Electro pneumatic, Airset Lock, Solenoid valve, volume booster , I/P Converter, Position, Transmitter, Limit Switches, Proximity switech etc.